I’m a big fan of this Chardonnay. It just hits me right on every accord, and I’ve heard from quite a few readers who have also enjoyed previous vintages. So to see the 2012 pop up was a real treat. 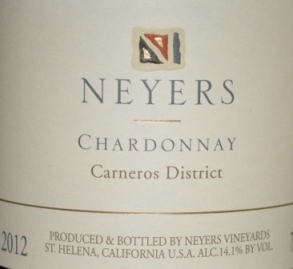 It pours a medium yellow; aromas of citrus and a bit of oak. Mid-end palate is really where I think this wine shines. The citrus flavor turns to more of a butter, butterscotch toward the finish, surrounded by just enough oak to add another layer of complexity. Long finish. A bit of minerality towards the end. But butterscotch being the key element, and one that I don’t normally gravitate to, but somehow they pull it off. This is a great food wine too. We paired with some of the wild sockeye salmon that’s at Costco right now (Copper river made its run by the wild sockeye is really good too. And the prices are unbeatable). I gave the 2011 vintage of this wine a 91 and will keep my rating the same. I’ll also add to the Top Picks list. Chardonnays can be really different and appeal to people in different ways. For me, this one really works. (I didn’t get the price or item number. My son had a picture drawn on the back of the receipt and then we lost it. I believe it was around $20 which is less than prior years on a better vintage).